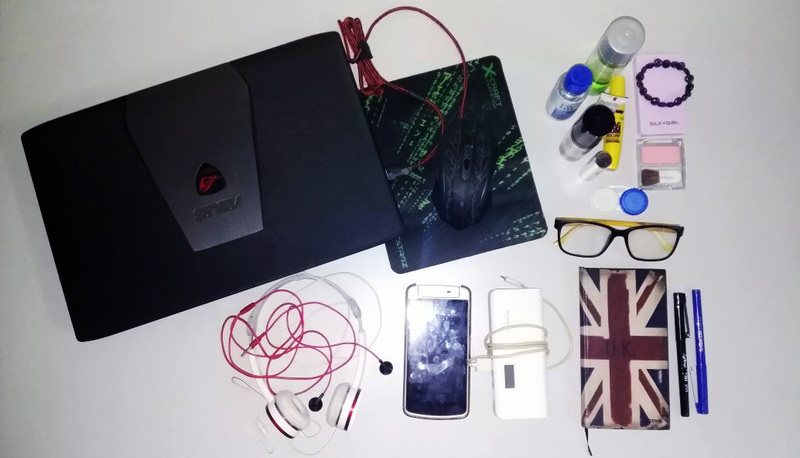 These are my everyday essentials which I can't go a day without except when I'm away from home for travelling. My Oppo N1 Mini is three years old already and still functioning so well. It's my first ever smartphone which was a present from my dad so it has sentimental value for me. The most important thing there is in my phone is my contact lists as I never jotted them down in a notebook. But I do remember my parents' number, thanks to their unchanging phone number for the past 24 years. Asus Republic Of Gamer is my first ever laptop that I bought using my own money so I treasure it a lot, like I never let any dust reside on it. I never miss to be on my laptop every night especially for my freelance works. I also do blogging only on my laptop as the phone screen isn't big enough to have a satisfying blogging experience. Other than that, of course, watching my favourite K-drama and online gaming, I can't survive without these two. As music is my sugar dose, I can't live without these two. I use headphone when I'm using laptop while earphone when I'm using phone. I have a bad habit of listening to music while sleeping and I use earphone for that purpose. On top of that, I charge my phone using my power bank at night as my phone's battery went drained for the day. Charging my phone using power bank + listening to music using earphone while sleeping is a bad combination, I know. Though I have lots of notebook but I usually use only one, the British flag notebook in the photo above which was given by my brother. I jotted important notes such as account details, work-related notes, blogging ideas, simple sketches and even wrote diary in it so I'll be miserable without this notebook. The pens I use for writing and sketching are Artline 220 Super Fine 0.2mm tip in black and blue colour. I always carry the notebook and the two pens in my bag. As I mentioned before here, I couldn't live without contact lenses as I think that I'm hideous wearing glasses. I wear contact lenses even if I just want to go to a nearby market. Though I wear contact lenses the most, glasses is still an essential to me as I wear them when I'm staying home. Just like contact lenses, I wouldn't step out of my house without applying my simple make up routine, except when I went for sport activities such as jogging or hiking. Along with the make up, I'll wear a bracelet too as I'd feel incomplete without something on my wrist. Though I have tons of bracelets, I always wear the one in the photo above as it's my favourite. When I'm going out: Contact lenses, purse, handphone and my compact powder. Mine would be phone, laptop and internet. I would never survive a day without these things haha. Same! I only blog using a laptop because it's not comfortable to write a blog post using phone. Even though my phone's screen is quite big but naaaa I want it to be bigger. simple make up kita mcm sama. haha. a lil bit foundation + pink blush + mascara. oh my. im feeling excited here sbb rutin sama. bahahaa. My everyday essential would only be a phone, internet and simple make up.. haha.. Laptop would be my essential only if I'm back to Seremban and of course, for blogging and k-drama.. haha.. I believe having a notebook around is a good habit, right? High five! hehe. these two are the must-thing to have along us every minute! moisturizer is really good for dry skin. I've dry skin too but no idea why I didn't use it haha. of course my iphone ! banyak benda penting dlm tuuu. my lipbalm,powerbank and purse. nobody boleh survive without phone nowadays kan! Mine would be phone, wallet, my compact powder and lipstick/lip balm. Kalau blogging, dulu siqah guna phone je. Sejak tahu yang gambar akan full view kalau update guna laptop, terus siqah update blog guna laptop saja. Tapi takde laptop sendiri lagi, pinjam suami punya. Hihi. Untunglah ada orang boleh bagi pinjam hihi.